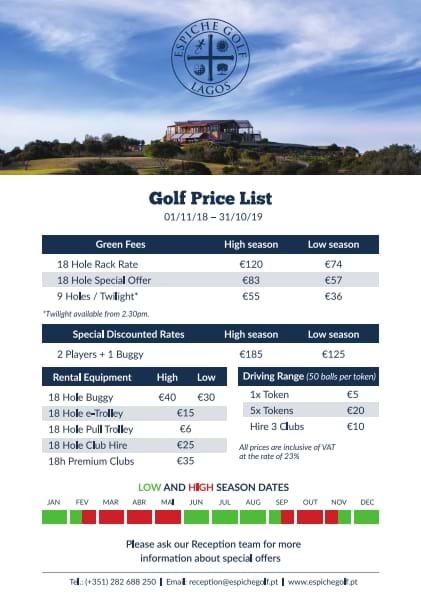 At Espiche Golf, we believe that golf should be enjoyed by as many people as possible and we have developed our competitive golf rates to reflect this. The importance of encouraging future generations of golfers to be able to improve their game, while enjoying a top quality course developed along sustainable guidelines, is an essential part of the Espiche Golf ethos. As such we are proud to offer free play for juniors under the age of 16 when accompanied by an adult. We additionally offer have a variety of rate options - see below for our green fees for the high and low seasons. (The 2 Player + Buggy Package is not available in March and October).